(CNN) -- The White House indicated Wednesday that a report and a photo from the controversial low-altitude New York flyover by a 747 plane used as Air Force One could be released soon. A 911 caller on the day of the flyover said, "There's a plane falling. There is a big aircraft falling like 9/11." Earlier, White House officials had said that there were no plans to release photos to the public. But the tone seemed to change on Wednesday. "The report, I believe, will be concluded at some point this week. We'll release its findings and release a photo," White House Press Secretary Robert Gibbs said during his daily press briefing. The review, led by Deputy Chief of Staff Jim Messina, will focus on "why that decision was made and to ensure that it never happens again," Gibbs said. The flyover, officials said, was a training mission -- it was also a government-sanctioned photo shoot. Military officials also estimate that the mission and the photo shoot, aimed at updating file photos of Air Force One -- cost $328,835 in taxpayer money. But they said "the hours would have been flown regardless, and the expenses would have been accrued on a different mission." The photo shoot, which President Obama said he was "furious" with, happened on April 27. The image of a low-flying plane accompanied by an F-16 fighter jet sent some New Yorkers into the streets and into a panic -- reminding them of the tragic 9/11 attacks on the city. White House Military Office Director Louis Caldera later apologized for the flyover. A YouTube video showed people standing in a parking lot, watching the plane approach. As it nears, they begin to run. "Run, run!" said one person. "Oh my God," cried another. A 911 call, released later by the Hudson County Sheriff's Department in New Jersey, illustrated the fear and panic felt by residents since the 9/11 attacks. "There's a plane falling. There is a big aircraft falling like 9/11," a man says to the operator. "Everybody is running and people are crying and panicking." 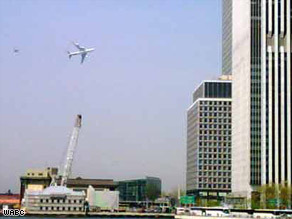 CNN iReporter Tom Kruk, who saw the plane and took a photo, called the sight of the aircraft low in the sky "unsettling." Mayor Michael Bloomberg was visibly angry last week. "I'm annoyed -- furious is a better word -- that I wasn't told," he said, adding that the decision by the White House Military Office and Federal Aviation Administration to withhold details about the flight were "ridiculous" and "poor judgment." But according to Air Force Capt. Anna Carpenter, local law enforcement agencies and the FAA had been notified of the exercise. New York Police Deputy Commissioner Paul Browne confirmed that department had been alerted about the flight "with directives to local authorities not to disclose information about it." That decision riled local media. "Given that we are not big on reminders of 9/11, we could have done without the whole thing. But the FAA outdunced itself by asking the NYPD to keep the photo op a secret, as if no one would look up and say, 'What the hell?' " the New York Daily News said on April 28. The New York Post, in its editorial on the same day, said: "The FAA had long preferred to keep passengers ignorant of these dangers. Better to have people panic, it seems, at the sudden sight of low-flying aircraft over Lower Manhattan. ... Someone needs to straighten out these folks -- quick." The controversy had some questioning President Obama's declaration of a new era of openness, who on January 21, said: "The old rules said that if there was a defensible argument for not disclosing something to the American people, then it should not be disclosed. That era is now over." "These are public records because they were done on government time, with government resources, and government personnel," said Patrice McDermott of openthegovernment.org. In New York, news that the photos might not be released reignited public outrage over the incident. "It doesn't seem right," said Kurt Wallin from New Jersey. "If we spent the money to have these photos taken, they should be available for the public to see." Emily Ritter from Park City, Utah, added: "I feel like maybe they're covering it up because it's been seen in a bad light already ... maybe they are still worried about their image and don't want to be seen in a bad light." CNN Homeland Security Correspondent Jeanne Meserve contributed to this report.